It's time to say Juley Ladakh! Hello Ladakh! After passing whole day yesterday acclimatising, we dared venturing out today. We started in the morning and headed straight to the Hemis Gompa monastery, which is about 40 kilometers from Leh city. The monastery was built in the 1600s by the Ladakhi king, Sengge Namgyal. Our guide, Tenzing, kept us well entertained all through the way with a lovely collection of songs from Zindagi Na Milegi Dobara and other Bollywood movies. Our driver, Palges, ensured that we had a safe drive! Tenzing told us that he was named by the Dalai Lama himself. Now the Dalai Lama's real name is Tenzin Gyatso, and our Tenzing claimed that Dalai Lama often names babies after himself! The route to Hemis Gompa snaked along the Indus, which barely looks like a river. That's the river that gave our nation its name. This is the river along which we once had a mighty civilization, the Indus Valley Civilization, some 3000 years back! The road, maintained by the armed forces, passed by a number of military establishments, Karu Garrison and many others. These brave men who guard the frontiers of our nation do deserve honors for putting up with adverse conditions to ensure we stay safe. Tenzing mentioned that the Ladakhi economy is sustained by tourism and the armed forces.While tourism is a seasonal phenomenon, much like agriculture there, the armed forces sustain the local economy in winter. The Hemis Gompa monastery, the oldest in the region, was quite impressive. Built nearly 600 years back, the monastery is home to the Drukpa sect of Mahayana Buddhism. Nestled between mountains, carved up by the elements, the monastery is surrounded by quaint little stupas. We started back for the Thiksey monastery and stopped by for lunch at a place called Chamba Kitchen. As always I opted for local fare. This was an earthy warm vegetable broth called Chutagi Thukpa. Chutagis are steamed dough, shaped like wontons. The Chutagi Thukpa was instantly and immensely comforting and pleasurable! The next stop was the Stok Palace of the Namgyal dynasty of Ladakh, which had ruled this cold desert for over 500 years. Stok Palace lies across the Indus. The approach to the Palace passes through patches of green. A unique thing in Ladakh is that the mountains and hills are starkly barren, the valleys are green and fertile! They grow wheat, barley, sunflowers, vegetables and fodder for cattle. The Ladakhis raise cattle, asses and sheep. They need to toil for six months to grow enough food and fodder to get them through the winter. The Stok Palace contained relics of the Namgyal dynasty. The Palace had a small shrine dedicated to the Drukpa sect and the Dalai Lama. And much to our amusement, our guide, Tenzing, took time to catch up with the caretakers of Stok, pretty Ladakhi girls, attired regally in purple. It was nice to know from Tenzing that the Ladakhis migrated from Mongolia long, long back. Proximity to Tibet, when the Silk Route was booming centuries ago, aligned the Ladakhis culturally with Tibetans. The result is that the Ladakhis today use the Tibetan script, use Ladakhi, a dialect of Tibetan, as their language and revere the Dalai Lama as much as the Tibetans do. The next stop was the Hall of Fame. 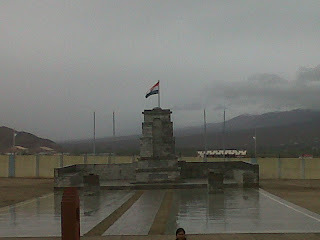 At the edge of the Leh air force station's runway, lies this little tribute to the nameless soldier of the Indian armed forces who stood guard and killed and died for the Indian nation. It was interesting to read about Zorawar Singh's expeditions into Baltistan and Tibet in the 1800s. But it was surreal and poignant to read about the accounts of the martyrs of various wars in this region, especially the letter of Captain Vijayant Thapar to his family moments before he died. The captured Pakistani arms on display spoke a story of our valour. The section on the Siachen battlefield, the highest warzone in the world at 20,000 feet, showed the struggle our men in uniform face day in and day out. But the best part was standing besides the unfurled Tricolour in the drizzle, watching the clouds move past the mountains, saluting our flag on our Independence Day. Undoubtedly this was the best Independence Day I ever had, that too on the roof of India! Awesome post. You are really a pro at this. Loved the description. You have a new follower.